Need an auger for your wooden fence posts? 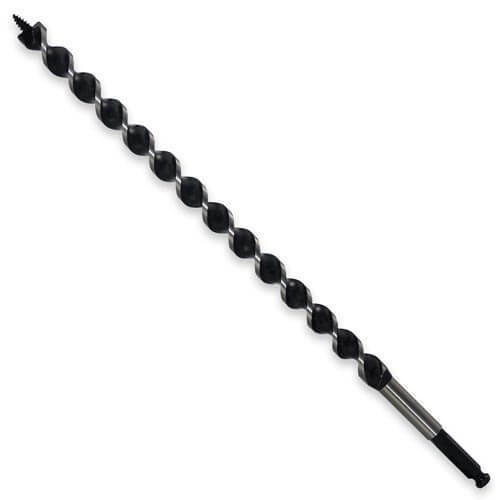 Our hard wood augers make installing your latches a breeze. Our smaller sizes are excellent for drilling holes for latches and for holes to run wire through. The 18mm and 20mm augers provide a great fit for our gate kits. We also provide bigger sizes which are better for drilling holes to run barb wire through your posts. If you are purchasing an auger to install a gate kit, we recommend you use a slightly larger sized auger. For example, if you are getting a 16mm gate kit, get the 18mm auger. If you need to pull the gate kit out in the future the larger hole will make it easier. It will simply slide in and out with minimal hassle. These augers have a coarse thread for faster penetration at low revs (250rpm). Let the auger do the work. All you need to do is hold the drill straight (don’t try and push it through the post). If it’s a big post, pull the auger out occasionally to help remove the wood chips. Each auger includes a cutting head with obtuse angles. This decreases the frequency between sharpens, minimising your downtime.